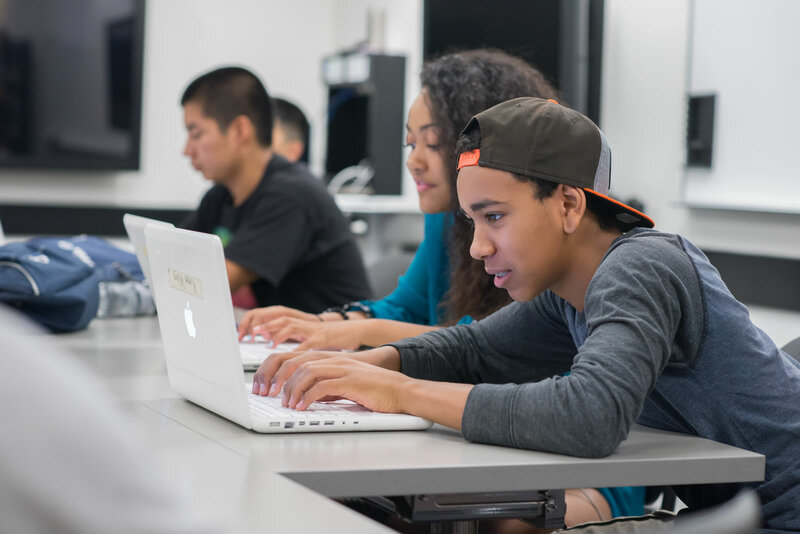 Underrepresented individuals are less likely to attend prestigious universities, complete STEM degrees, enter tech careers, and engage in informal entrepreneurship pathways, which minimizes opportunities to pursue and succeed in tech entrepreneurship. Students of color, particularly from low-income backgrounds, are much less likely to attend the top-tier universities that are overrepresented in the number of graduates receiving venture capital funding. In college, women and students of color are much more likely to pursue health, human services, and social sciences degrees than computing and engineering degrees. Industry experience is often used as a proxy for ability in assessments of tech founders’ potential for success. Given the gender and racial underrepresentation in the tech workforce, women and people of color are less likely to have had experience working for venture-backed tech companies. The lack of access to peer, mentor, and social networks from prestigious universities and tech companies prevents underrepresented groups from having access to referrals and introductions to VC firms and from receiving recommendations. 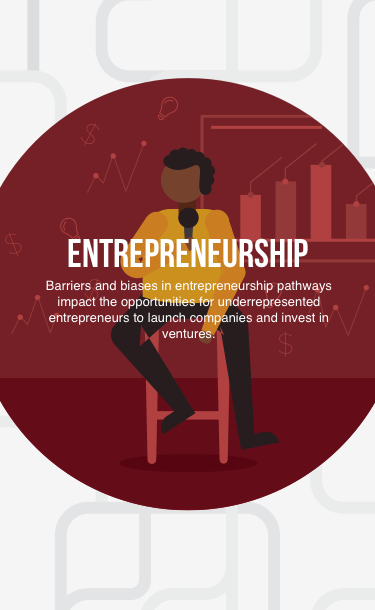 Entrepreneurship educational pathways tend to be informal and access to entrepreneurship networks plays a critical role in developing knowledge needed to launch a startup or small company. Stanford and UC Berkeley produce the most VC-backed tech founders. Black and Latinx students combined make up just 17% of UC Berkeley undergraduates and 22% of Stanford undergraduates. Underrepresented professionals have less access to financial capital and are less likely to have personal and social networks with access to the capital needed to finance new ventures. The historical lack of equal access to education, employment, homeownership, and business ownership has resulted in significant wealth disparities by race/ethnicity. White families have more opportunities to create generational wealth given more opportunities to own property, fewer years burdened by loan debt, and more capital to invest in new businesses. White families are 5x more likely to receive financial gifts and inheritances than Latinx and Black families and the value of those gifts are also much larger. White families are also more likely to have the capital to prepare their children for top colleges and send them to college without incurring significant debt. 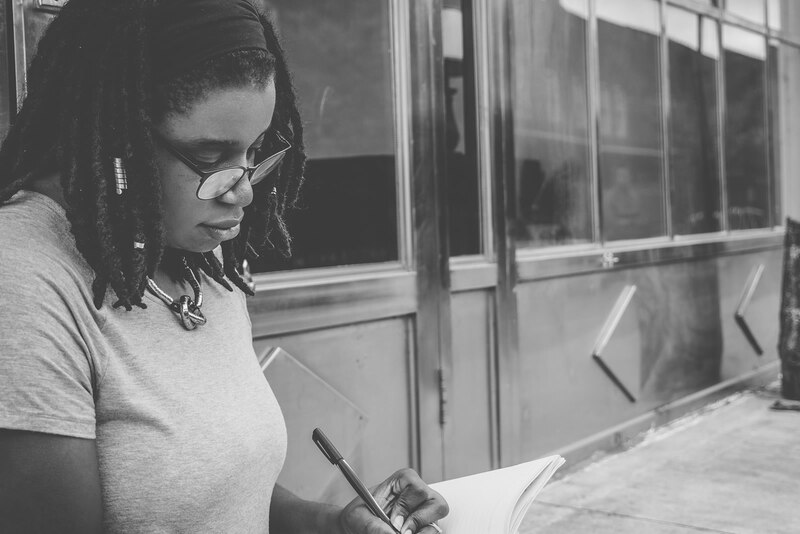 In the absence of intergenerational wealth transfer, entrepreneurs of color often lack the financial and social capital and are averse to taking the financial risks necessary to pursue entrepreneurship. Wealth is directly related to the decision to pursue entrepreneurship and financial constraints exclude those with insufficient funds. Source: Pew Research Center (2013). Entrepreneurs of color are less likely than white entrepreneurs to have access to the early capital necessary for family and friends fundraising rounds. Regardless of the quality of the venture, VCs are more likely to invest in companies when they share the same racial/ethnic background as the company's executive. 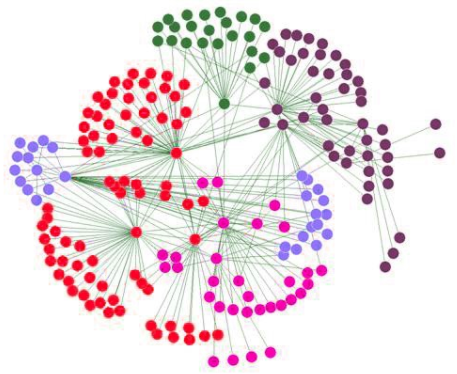 Social networks, including direct personal relationships and indirect relationships through shared connections or experiences, are directly tied to the ability of entrepreneurs to acquire VC funding. Social capital is influential in providing alertness to opportunities, endorsements and recommendations, access to funding streams within networks, and becoming familiar with entrepreneurship terminology, compliance rules and restrictions, and financial and licensing agreements needed to launch a startup or small company. Investors are more likely to invest in companies they have been introduced to through “warm leads” than companies led by individuals not in their social networks. Having a prominent investor increases perceptions of the quality of the company, and this informal endorsement can substitute for accomplishment and experience as the basis of investment. Given that social networks are highly segregated by race and gender, women and entrepreneurs of color have fewer opportunities to connect with the venture capital networks which are predominantly White and male to secure investment. The social capital of entrepreneurs is also correlated with investment absorption and exit status (IPO), indicating that social capital also plays a role in the long-term performance of venture-backed companies. Social capital is directly linked to the acquisition of VC funding. Investors are overwhelmingly White and male and the tech founders they invest in are overwhelmingly White and male. Unconscious biases affect investor judgement and decision-making, including the desire for “similarity” between investors and founders, looking for “pattern-matching” and similar demographic or educational traits from previously successful founders, making gendered assumptions about leadership ability, and correlating ability with degrees from top-tier universities. Gender differences are seen in types of questions asked of founders in pitch conversations: male entrepreneurs are asked questions about their aspirations, while female entrepreneurs are asked questions assessing their level of responsibility and vigilance. In VC investment decisions, male entrepreneurs are rated as significantly more likely to be successful than female entrepreneurs, and male entrepreneurs receive investments that are 5x higher than the investments female founders receive. The lack of connectivity of investors to entrepreneurs from diverse backgrounds creates unfamiliarity that contributes to risk aversion in investment in companies led by founders who are not white or male. As a result, companies founded by males receive 98% of all venture capital investment. Only 1% of all VC-backed tech founders are Black and just 17% are women. Stereotypes about the technical and entrepreneurial potential of individuals from diverse backgrounds can affect interest in pursuing entrepreneurship and performance within the domain. Stereotype threat, or the fear of confirming a negative stereotype about one’s group, can lead to lower performance (compared to ability) for women and people of color, specifically in technical and math-related fields. Stereotype threat is activated in situations where members of a negatively stereotyped group face evaluative scrutiny, when stereotypes are particularly salient, and when one is a single representative of a larger group. Hence, this threat can be activated for underrepresented entrepreneurs in pitches, board meetings, and informal networking settings. Stereotype threat can also lead to decreased interest and belonging in entrepreneurship. For example, women are less likely to indicate interest and intention in pursuing entrepreneurship, particularly when it is associated with stereotypically masculine characteristics. Photo Credit: Eye for Ebony on Unsplash. Bias, harassment, and negative workplace cultures within startups and venture capital firms negatively affect entrepreneurs, investors, and professionals from diverse backgrounds. Venture capital investors (98% of whom are White/Asian males) rank the diversity of startup founding teams and companies’ commitment to diversity as the least important important criteria in making investments. Roughly 80% of investors report that the companies they invest in have no diversity/inclusion efforts underway, suggesting there is little attention paid to ensuring environments are inclusive and welcoming for all employees. Nearly 30% of founders of color and investors of color report experiencing unconscious racism, while almost 20% of investors of color report experiences with overt racism. Almost 50% of female founders report experiencing harassment, including being propositioned in exchange for funding, promotions, a job, or connections. The lack of investor diversity and attention to inclusion in venture capital creates isolating, exclusionary, and unwelcoming environments for entrepreneurs and professionals from diverse backgrounds, which directly impacts satisfaction, retention, and turnover. Source: Women Who Tech/ Lincoln Park Strategies, 2017. 45% of female investors have witnessed overt sexism in the tech industry.